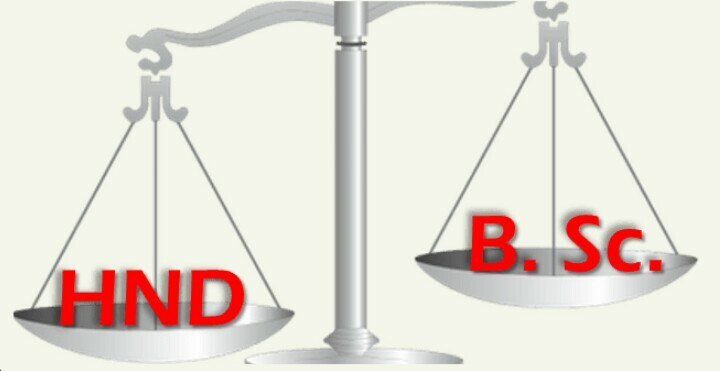 As the dichotomy between a BSC and HND certificate linger on in the country, we decide to share this piece with you readers to help have an incite of what the possible outcome of your decision might be. The information contained herein represent the opinion of an individual. If you are not self employed already and would be seeking for employment after your program, please I beg you in the name of whatever you worship, don't buy that HND form. Don't make that mistake. Buy Direct Entry form or buy UTME form to start afresh at a conventional University. You also have the opportunity of approaching any Open University study center close to you and explore the opportunities therein available. All of these would eventually make you get a University degree. Worry less about the number of years and fund involved. Please don't buy that HND form. Don't be fooled by those who will tell you that you can always proof your worth on the field. See, the truth is that you may not even be given the opportunity to proof anything at all. A large percentage of Nigerian employers including the government worship certificates and there isn't any traces that they might change any soon. Take for instance, Ogun government commenced the sale of ASCON forms for the employment into the civil service of the state and HND holders are barred from partaking in the exercise. Even if you make it to the civil service through other avenues, there's is a level beyond which you can't rise because of your HND background. Why would you want to be subjected to such ridicule? Don't buy that form! You may also be thinking of doing PGD, Masters and PhD later on. Well some universities wouldn't let you pass the Masters stage. LASU for Instance specifically stated that MED holders with HND and PGDE background are not eligible to apply for PhD. You see, the discrimination is huge and you wouldn't like it later on. Please drop the idea of the HND form. Don't get carried away with the fact that HND holders are also called graduates and are allowed to partake in the NYSC scheme. See, the euphoria of their 'graduates' status expires with NYSC. If you doubt me, try to pick up a masters form with your HND after your NYSC. The discrimination is huge and you wouldn't like it. It is good to be educated but please be educated properly at least In Nigeria's context. This is because the most ridiculed certificate in Nigeria now is the HND Certificate. Again, if you don't have a business of your own and would be seeking employment later on, don't buy that HND form. My two cents.